Dean of the Perdana University-School of Data Sciences, Dr. Mohammad Asif Khan, has been elected as the President of APBioNet. In addition, Dr Yam Wai Keat was elected Vice President (Education and Research). Dr. Ong Hui San and Dr. Ranjeev Hari are appointed as ExCo Treasurer and Secretary, respectively. Congratulations to all faculty members! The Secretariat of the Asia-Pacific Bioinformatics Network (APBioNet) is pleased to announce the results of the office bearer position appointments and the formation of the new Executive Committee (https://www.apbionet.org/organisation/), following the results of the recent election for the term 2018-2020. 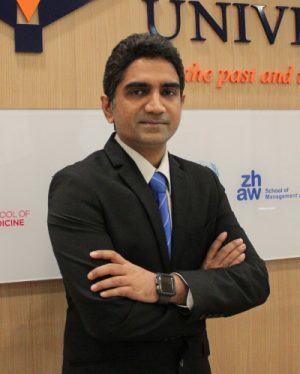 Dr. Mohammad Asif Khan from Perdana University, Malaysia, who has been an ExCo member since 2010 and has served in various roles, is the President-elect. Dr. Khan is the fourth President to serve and lead APBioNet, and will be supported by two Vice Presidents, a Treasurer and Secretary. The Immediate Past-President and a long standing ExCo Member, Dr. Christian Schoenbach from Nazarbayev University, Kazakhstan will serve APBioNet in his role as the Vice President for Conference and Outreach. Dr. Yam Wai Keat, from Perdana University, Malaysia, helms the position of Vice President (Education and Research). Dr. Ong Hui San and Dr. Ranjeev Hari, from Malaysia, are appointed as ExCo Treasurer and Secretary, respectively. Dr. Bruno Gaeta of University of New South Wales, Australia, Dr. Kenta Nakai of University of Tokyo, Japan, Dr. Ge Gao of Peking University, China and Dr. Sissades Tongsima of BIOTEC, Thailand will support the office bearers in their role as ExCo members. Congratulations to all the ExCo members on their appointments, to lead APBioNet for the term 2018-2020. A vote of thanks goes to the outgoing ExCo members of the 2016-2018 term, led by the Immediate Past-President Dr. Christian Schoenbach. APBioNet is a non-profit, non-governmental, international organization founded in 1998 that focuses on the promotion of bioinformatics in the Asia-Pacific region. In 2012, APBioNet was incorporated in Singapore as a public limited liability company to ensure quality, sustainability, and continuity of its mission to advance bioinformatics across the region and beyond. APBioNet was established during the Pacific Symposium of Biocomputing, Hawaii in 1998, with Dr. Tin Wee Tan as Founding Convenor and Secretariat and Dr. Subbiah Subramanian as its Founding President, with Dr. Shoba Ranganathan as Vice-President. In 2002, Dr. Ranganathan was elected as the second President of APBioNet and brought it to greater heights. Recognizing the great need for a bioinformatics conference, Drs. Ranganathan and Tan shepherded the birth of the first International Conference of Bioinformatics (InCoB) in 2002, held in Bangkok. InCoB was then adopted as the flagship conference of APBioNet. Dr. Christian Schoenbach continued the pioneering work of Dr Ranganathan by taking over as the third President of APBioNet. APBioNet’s mission, since its inception, has been to pioneer the growth and development of bioinformatics awareness, training, education, infrastructure, resources, and research among member countries and economies. Many of the initiatives and activities have been initiated through its flagship conference, InCoB. The 17th InCoB was recently held at the Jawaharlal Nehru University, New Delhi, India, with 314 participants. In 2019, the 18th InCoB will be held at Universitas YARSI, Jakarta, for the first time in Indonesia. One of the immediate activities of the new ExCo would be to oversee the successful organisation of InCoB’s sister event, the 2nd International Symposium on Bioinformatics (InSyB2018), to be held in Malaysia from 20-21 Dec, 2018. The new ExCo aims to lead and pioneer new frontiers for the development and growth of bioinformatics in Asia-Pacific.